Bangkok (Thailand) – April 3, 2019 (travelindex.com) – This coming Thailand’s traditional New Year, Bangkok will see a splendid celebration on the bank Chao Phraya River from April 11-15 2019 at ICONSIAM. This festivity is made possible by the Tourism Authority of Thailand, ICONSIAM and Department of Cultural Promotion – Ministry of Culture, in association with government and private sectors including Bangkok Metropolitan Cultural Council, Kasikorn Bank, SOOKSIAM, The Association of Chao Phraya Commerce and Business and Chao Phraya riverside communities. The five-day grand celebration will feature an endless list of Thai traditional and cultural activities. The event announcement was made at the press conference on 2 April 2019 at ICONLUXE Hall, 1st Floor, ICONSIAM, Charoen Nakorn Road, Bangkok. Narong Chearavanont, Vice Chairman of ICONSIAM, said that “ICONSIAM has always cherished Chaophraya River and the Thai cultures and tradition that has flourished along the river. And for the coming Thai Traditional New Year, our focal point is definitely staging a feast to preserve and pass on Thai cultural heritage to the world. 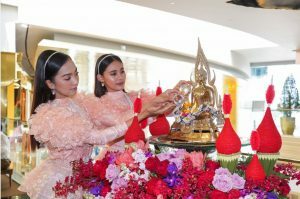 “THE ICONIC SONGKRAN FESTIVAL 2019 AT ICONSIAM” will showcase highlights of each Thai era through numerous activities and events that spanned across 750,000-square-meter of our riverside property – the city of glorious eternity. Experience the spirit of Thai with Buddha Bathing Ceremony where devout Buddhists pour scented water on Buddha images for New Year blessings. Four most highly worshipped Buddha images of each Thai era will be graciously presented – Shinnasri Buddha from the Sukhothai period, NimitVichitmarnMolee Sri SanpetchBorom Tri LokNart Buddha representing the Ayudhya period, BuddhamVisethSasada Buddha from Thonburi Dynasty and Siam DhevaThirat Buddha of the Rattanakosin period. Also on display will be Songkran Exhibition, depicting the festival’s history and tradition, cultural performances like Viva Songkran Dance, Silk Reeling Dance, traditional drumming or Klong-Sa-Bad-Chai and traditional North-Eastern Thailand dancing or Vichanee Serng Tung Wai. Visitors can also take parts in free Traditional Thai Heritage Workshops such as making the scented fan and scented water, Thai-pattern fabric painting and the art of fruit and vegetable carving, plus dressing in Thai traditional costumes for photo opportunities, all free of charge. Top Thai actresses will light up the ICONSIAM Songkran Niramit Procession that portrays traditional Thai’s court culture in four eras – Sukhothai, Ayudhaya, Thonburi, and Rattanakosin. Four actresses including Ann Thongprasom, Natapohn ‘Taew’ Taemeeruk, Woranuch ‘Nune’ Bhirombhakdi, and Chalida ‘Mint’ Vijitvongthong will lead the exquisite parade as Songkran Goddess or TungsaDhevi in custom-designed traditional costumes that represent each glorious period. The festival will also featured a concert from Nont Tanont and Da Endorphine plus water splashing with the “Cute Boys” along the Chao Phraya River. In addition, SOOKSIAM @ ICONSIAM and Thai Beverage PLC will co-host “SOOKSIAM YooYenPenSook @ ICONSIAM,” where the stories along the majestic river are connected and intertwined. Seven activities that embrace the typical Thai happiness or Sook also await. “Sook Som Wang”willallow people to bathe the Buddha images from 4 regions of the country. “Sook SuebSarn and Sook Sampan” is an opportunity to pour water on Ban Bang Khae elderly’s hands for their blessings. ‘Sook Sanook” will offer Ferriswheel, egg pond game and sand pagoda making. “Sook Saneh” will be a Songkran beauty pageant contest in the Sook Siam City. “Sook Saeb”willdeliver arrays of delicious Thai cuisines from different regions. “Sook Sang Sun” will indulge shoppers withThai hand-craft products. Yupa Panrod, Executive Director Events Department at the Tourism Authority of Thailand (TAT), added that “The collaboration to organize this event- ICONSIAM Magnificent Chao Phraya Grand Songkran Celebration Festival at ICONSIAM, the country’s latest landmark and tourist destination, is major. Thanks to ICONSIAM and its allies and all the riverside communities, both government and private. This event will be a key celebration of Thai tradition, a great Thai tourism promotion and an underlying message that the historic Chaophraya is a national iconic landmark and one of the world’s best tourist destination. The press conference on “THE ICONIC SONGKRAN FESTIVAL 2019” was a great success. The opening started with a magnificent performance of Miss Grands who represented each period of our Thai history. Each Miss Grand showcased the beauty of each Thai period through traditional costumes. Representing the four Miss Grands were Miss Grand Ayudhya Pai-Thanisa Panyapoo, Miss Grand Chumporn Moothong-KamonchanokKanbua, Miss Grand Satul Pamai-OrnanongInthum and Miss Grand Chon Buri June-Pinicha Kijkasempongsa. Another grand event was the introduction of Noon-Woranuch Bhirombhakdiin gorgeously beautiful Thai costumes. Other activities included drumming parade and water splashing to celebrate Thailand Traditional New Year. These performances were just a start before the arrival of “THE ICONIC SONGKRAN FESTIVAL in 2019.” The people responsible for organizing the festival and its preparation were Supot Chaiwatsirikul (Managing Director of ICONSIAM Co., Ltd.), Chayapong Naviroj (Chief Executive Officer of SOOKSIAM), Dr.Chanarong Luckshaniyanavin (Chairman of Bangkok Metropolitan Cultural Council), Waraphan Chaichanasiri (Director Cultural Network Division), Amorn Suvachittanont (First Senior Vice President, Kasikorn Bank), Prinya Rakvathin (President of Association of Chao Phraya Commerce), and Thiranant Chuangpichit Chairman of Kadeejeen-Khlongsan Neighborhood Foundation. Celebrities in Thai costumes include Kleddao Panichsamai, M.R. ChanladaYukol, Kuntinee Krairiksh, Jeab-Sopidnapa Chumpanee, M.L. OradisSanidvong, and Nont Tanont.